Hot water, radiant floor heating and condensation boiler in Santa Fe, New Mexico This installation, from our perspective, presents an almost perfect energetic combination. 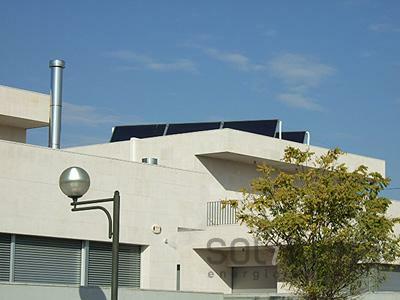 Solar hot water + solar heating + radiant floor + pool climatization + air conditioning in Colorado Springs, Colorado The solar collectors that feed the hot water and the radiant floor heating system are on the back building´s facade. The radiant floor has been equipped with a cooling system using a reversible heat pump. Solar hot water and heating in Fort Worth, Texas Solar energy can be used, not only to generate hot water, but also to support the heating system in winter, which translates in significant fossil fuel savings. Solar hot water + heating + heated pool in Amarillo, Texas. Single-family home of 200 m2 with a family of 4. Solar energy in Ontario, California Solar energy can be used not only to generate hot water, but also to support the heating system in winter, which represents significant fossil fuel savings. Solar heating, hot water and gas boiler in St Petersburg, Florida. 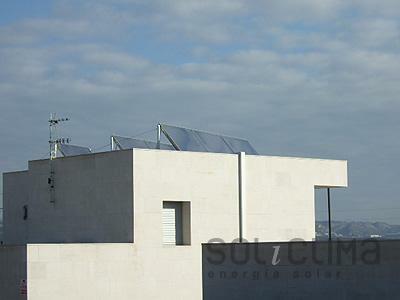 This time we see an installation of solar hot water for a 4 person 200 m2 house. Solar energy for hot water and heating in Chula Vista, California. To heat water using solar energy, we can use the so-called solar vacuum tube collectors, present in the photograph, which are characterized by a higher return, they can heat water to a higher temperature. Solar hot water and heating for a 3 story apartment building in Charleston, South Carolina. Installation of hot water and radiator heating and a high-performance diesel boiler with a 1000L deposit, in 3 apartments. This installation, from our perspective, presents an almost perfect energetic combination. First, it uses solar energy to generate both, hot water and heating. As a backup system for heating, it uses a condensation boiler, which is a high performance gas boiler, because it extracts heat from the combustion smoke and uses it for heating, something other boilers don´t do. The radiant floor is used as a heat distribution system. This system also works for cooling, but, given the latitude and altitude of the facility, the customer did not consider necessary to take advantage of this feature. Radiant floor heating has several advantages over heating with radiators, besides its ability to cool. Since it consists of a hydraulic circuit that runs under the floor of the rooms, it does not limit the furniture distribution. Even more important is the comfort and efficiency it provides. To be effective, it needs a lower temperature than radiator heating, thereby, saving on fuel. The heat is also much closer to the user's body.